Your customers are still on site, but preparing to leave for the day. It’s been a long itinerary of meetings, presentations, and info dumps. You know they’ve made good use of their time, and have learned quite a bit from their visit to your location. They shake some hands for good measure, deliver well wishes, and then head for the exit.Your mission is complete, or is it? What happens next? Once those customers leave your property and effectively remove you from their short term memory, how can you be sure they’ll think of you, or your products and services again? If that is the end of your engagement, then yes, they certainly will forget you, except for a select few. What you need to do is follow-up. This entails reaching out—after they’ve had a local experience—to keep them engaged, and keep your brand or services at the forefront of their minds. One of the key failures in customer experience stems from the lack of follow-up. Marketing, networking, advertising, building connections, and outreach—none of it works if you’re not willing to follow-up after the initial interaction. Yes, follow-ups can be uncomfortable for professionals. Many believe that they are giving the impression that they are aggressive, and that you are eager to close a deal. In reality, that’s exactly what you want, so why avoid using this tactic? For starters, a follow-up will boost your relationship with customers or clients, showing them they matter enough to warrant the reach-out. It helps them remember your brand and services, and it keeps your content on their mind. It also keeps their expectations in check, and provides them with more reasons to seek future interactions with your brand. More importantly, a reliable follow-up allows the customer to be heard, and helps you build a strong rapport which could lead to a loyal relationship. It’s a great opportunity to ask what your customer wants or expects from you. It’s also a great time to enhance communication, and provide them with the opportunity to share their own knowledge and experience—you likely don’t have time to do this when they’re visiting your EBC events or attending meetings. According to Salesforce, 80 percent of sales require 5 follow-up calls after a meeting to be successful, meanwhile 44 percent of sales reps give up after a single follow-up. Then why doesn’t everyone use them? Why is there such a lack of follow-ups and repeat communication in the business world? Honestly, we don’t know the exact reason. But there are many possibilities for why this could be so. In a business or enterprise, there’s often so much going on that it can be tough to keep track of various duties. Follow-up, or the secondary contact with a client, is one of those responsibilities that just tends to fall by the wayside. If you don’t define a proper agent for doing this in a timely manner, then it will never get done. Who is responsible in your company for reaching out to potential clients? In a typical firm, with anywhere from 100 to five-hundred employees, there is an average of seven people involved with buying decisions at a given time. That can make things extremely convoluted, especially when you’re trying remain accountable by organizing and assigning the task. Whether before, during, or after a visit to your EBC, the content you deliver to your audience matters greatly. If your customers cannot find relevant content or spend too much time sorting through what you have available, your efforts are going to be largely ineffective. At a moments notice, you need to be able to deliver the kind of content and experiences that match up your customers wants and needs. This means tailoring the content of their visit, and any follow-up content delivery streams for maximum efficiency. In the off chance that you don’t know what content has to do with follow-ups, consider this: When you conduct a follow-up, you do it through one of several communication channels, be it email, social media, traditional voice, etc. During the engagement, you’ll need to present “content”, that can be consumed, which forms the basis of your discussion. Marketing, in general, is all about your timing. You must present the content or proposal to customers at the appropriate time, you must know where they are along the buyer journey at any given time, and you must know when it’s appropriate for you to reach out and interact. Follow-ups are nearly the same, with exception to the fact that you’ve already engaged once or twice before with the customer(s) in question. The faster you respond and deliver relevant insights, the better results you’ll have. You need to better understand the customers you’re reaching out to. What is it they want from you? What stage are they at in the buyer’s journey? What are they looking for and what do they need? Often, these can be two different things. Follow-up too soon and your response may be wholly ineffective. Follow-up too late, and your customer is just going to ignore your efforts. It’s important that you establish a proper, effective timeline. Consider this: At any given time, only 3 percent of your market is actively buying goods or services, while 56 percent are not ready and 40 percent are preparing to start the process. So, for the sake of your follow-through, be sure you’re contacting your customers during the right stage. Mind your timeliness, so to speak. One of the greater solutions for poor follow-through in the modern age is indeed mobile connectivity. 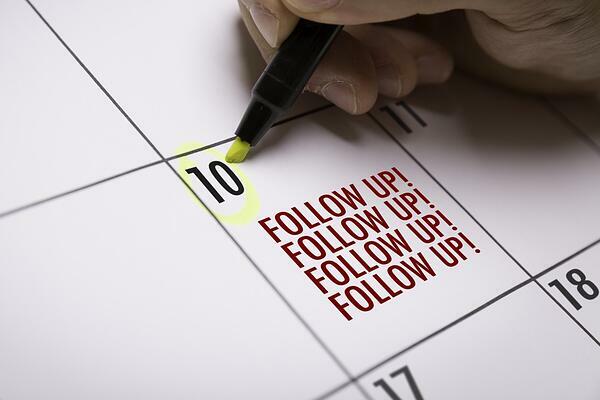 The power of follow-up can and will be harnessed through mobile platforms and mobile apps. Notifications are a great way to reach out and engage with your customers on subsequent dates or times, and typically get higher click-through rates than email. 1-to-1 messaging or instant messaging services are great for direct conversations, anywhere, anytime. This allows team members and customers to have meaningful conversations, even when they’re on-the-go. Through a news-feed style setup or promotional page/app section you can deliver content on a regular basis. This makes it much easier for your customers to interact with your content, and keeps it saved and relevant for longer periods of time. They can access it from just about anywhere, no matter what they’re doing currently. Imagine how many will be reading your content during a morning commute or some personal downtime? By nature, mobile apps—especially when they employ social interactivity—allow you and your customers to become part of a greater community. This helps drive perpetual engagement and interaction, building a more solid relationship and reliable avenue for potential sales and marketing efforts. Through mobile, you can deliver interactions and integration with other physical components or experiences. This allows you to further optimize your exit and follow-through strategies. For example, location-based beacons can be used to trigger a goodbye or promotional message as they exit your facility. The primary takeaway should be that the modern customer experience—and your responsibility—doesn’t just end once people exit the boundaries of your local center. In fact, it goes well beyond the walls of the average EBC, and that’s exactly what you should be prepared to achieve. A proper follow-through is necessary to garner repeat business, build stronger relationships, and make any EBC-visit worthwhile. You just need to understand how to go about it properly, who on your team is responsible for taking action, when it’s the right time to branch out, and what the best, preferred and/or optimal channel is.